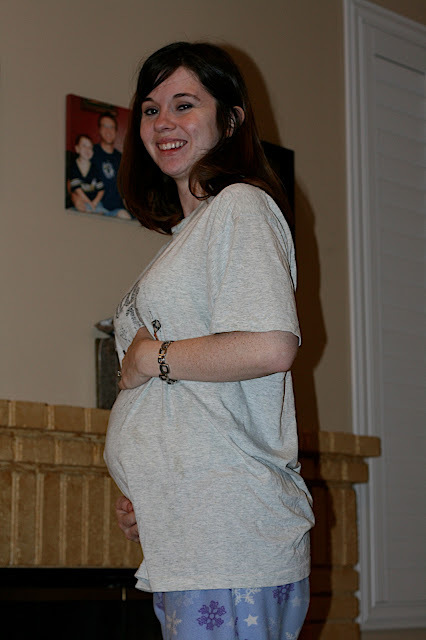 I realized I haven't really said much about being pregnant, other than when I announced it. My next statement is probably going to make a lot of people mad, so I apologize in advance... but well I almost forget I am pregnant. I have been very blessed to have great pregnancies; but deliveries not so much. I was in labor with Lucas for 18 hours, 4 of which I literally spent pushing (no meds the whole time). He was right there and I just kept thinking, this time he will come. I think I pushed from every position possible, even on my hands and knees.. but nothing. By the end I could not believe how completely exhausted I was. After almost four hours the doctor finally came back in and tried to use a vacuum to help him out. By this point I really just don't know if I could push anymore. So 18 hours of labor, ended with a c-section. Let's just say a scheduled c-section with no labor is much better than the first time around. And so here I am the third time around, I will obviously just go the scheduled c-section route again. The great thing about that is I have a say in my delivery date. I am due July 8th (or 11th-depending on who you ask), and so I figure I will shoot for the 1st. Why the 1st? Well June 30th a little movie called Eclipse comes out and I really want to be there. and yes that is my belly button already sticking out. Don't worry, some of us just have easy pregnancies. It might explain why I have so dang many kids. You look tiny and cute still, but soon enough you will be feeling pregnant. Enjoy your comfort while you can! Oh oh oh oh I just love baby bellies!! Wonderful..joyful whoot! 15 weeks already..wow!! I didn't have any problems with my first four..but Nonni..uhgggg..I felt pregnant for nine months ..of course I was 43..I felt it! Having easy pregnancies and deliveries (Fox at home with a midwife) could explain my five wonderful kiddos! So very happy for you hon!!! Enjoy! You look absolutely darling, PJs and all. My Princess was on target to be early and I wanted her in June vs. July so she'd have pearl as her birthstone. Guess who was born on June 30??? LOL! Not sure if I've have made changes for a movie, but I like the way you think!!! You look wonderful... I had easy pregancies and deliveries, maybe this one will be easy. Oh my goodness, you are a brave woman! 18 hours with no meds... my hero! I am so glad your pregnancies are so easy though. What a blessing in that regard. I too have easy pregnancies and while I don't have C-sections I am induced and get to set the date. Now two of my kids share a birthday with a family member one with my mom and one with my brother. My sister has easy pregnancies and hard deliveries too. Cute little belly. My belly button never pokes out. Eclipse is coming out ALREADY?? How exciting! I can't wait to see it. You are adorable! I have also gone through the emergency c-section, so no judgement here! You gotta do what's best for mama and baby-July 1st sounds perfect! Looking good! My belly button never once stuck out. Mine is really deep. You look just as cute as can be. I'm so excited for you guys! And when you find out if it's a boy or a girl, the fun will really start! you are just so cute. Looking good! I love it. Aw, you look so cute. I love the pregnant glow. I had two c-sections myself and was hoping to have natural the second round, but no go. I had no idea that you were expecting. How exciting. And how unfair that you look that good when you're pregnant. That is awful that they let you push for so long! I can't believe they would leave you in agony for more than two hours! Congratulations (since I am a new follower!)! I am so happy for you! *Sigh*! My baby is 27 months old! I am trying to wait patiently for God's timing! I had both of our's at home with a midwife! God bless you with a wonderful pregnancy and birth! You look fab for being 15 weeks!!! CONGRATS! You have the cutest belly and your belly button sticking out already, I can't believe it! Keep up the progress notes, I love reading them. Awww...what a cute baby belly! I am so excited for you. I too am blessed with easy pregnancies, and sometimes would forget I was pregnant! I can't wait to "meet" the little sweetie! Awww, very cute. I pretty much live in pajama pants these days. Tender!!! I didn't even know you were! Congrats! : ] hope everything goes well! I am so happy for you! It's quite a blessing to have easy pregnancies:) I was always sick for till 20 weeks or so...but incredibly easy deliveries. So we are evened out here-haha. My Katya was born July 6th. I love having babies in the summertime:) I think July 1st is pefect.